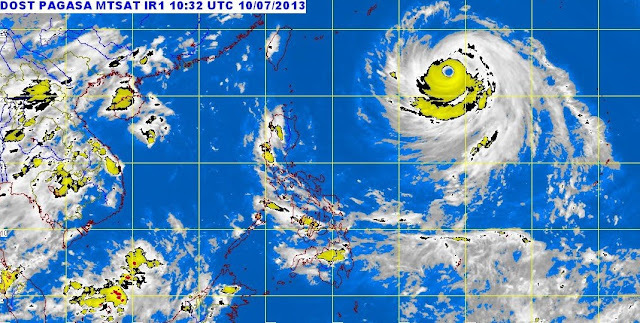 The weather bureau PAGASA issued forecast, July 10, 2013 for the movement of typhoon "Huaning". At 4:00 pm today, the eye of Bagyong "HUANING" was located based on available data at 1,150km east of Itbayat, Batanes (21.6N, 134.4E). "Huaning" have maximum sustained winds of 175kph near the center and gustiness of up to 210 kph. It is expected to move West Northwest at 20 kph. According to PAGASA, Cagayan Valley, Bicol Region and the provinces of Aurora and Quezon will experience cloudy skies with light to moderate rainshowers and thunderstorms. Metro Manila and the rest of the country will be partly cloudy to cloudy with isolated rainshowers or thunderstorms. Moderate to occasionally strong winds blowing from the northwest will prevail over eastern Luzon and coming from the west to southwest over eastern Visayas. The coastal waters along these areas will be moderate to rough. Light to moderate winds coming from the west to southwest will prevail over Mindanao and the rest of Visayas and from the northwest over the rest of the country. The coastal waters along these areas will be slight to moderate. As of 7:00PM today, thunderstorm is affecting portions of ‪ ‎MetroManila‬, ‪Tarlac‬, ‪Pampanga‬, ‎Bataan‬, ‪Laguna‬ and nearby areas within 2hrs. All are advised to take precautionary measures against heavy rains, strong winds, lightning and possible flashfloods.